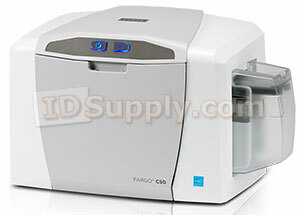 Designed for businesses, schools and government agencies, the HID Global FARGO® C50 is an easy-to-use and affordable printer that can reliably print full-color employee ID, loyalty, payment or membership cards. With a sleek, smart design, the printer requires virtually no maintenance and can easily fit into the smallest offices settings. Includes a two year warranty. 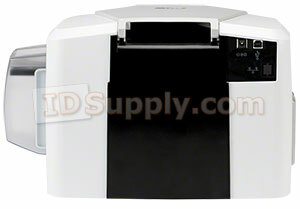 Printer includes 100 print YMCKO ribbon and 100 blank PVC cards. 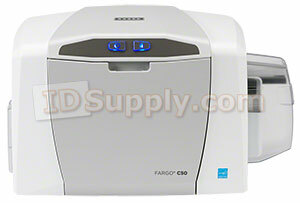 Begin printing cards in minutes. Experience outstanding performance and unrivaled quality from the leading brand in card issuance. From ordering to installation, users receive outstanding and ongoing product support the minute they open the box. Built-in Swift ID® badge application allows you to create ID badges in seconds without having to install any additional software. FARGO Workbench™ printer maintenance and diagnostic software ensures optimal performance at all times. Enjoy edge-to-edge printing in full-color or monochrome. Expert online and phone support. Options include easy-to-use ribbon with disposable ribbon cartridge (EZ) and more economical and ecofriendly refill ribbon for cartridge (ECO). When placing an order for subsequent ribbons, please specify the part number to guarantee ribbon compatibility with your individual printer. Supply Voltage: 100-240Vac, 50-60Hz, 1.6 amps max. * Indicates the ribbon type and the number of ribbon panels printed where Y= yellow, M= magenta, C= cyan, K= resin black, O= overlay, B= dye sublimation black. ** Print speed indicates an approximate print speed and is measured from the time a card drops into the output hopper to the time the next card drops into the output hopper. Print speeds do not include encoding time or the time needed for the PC to process the image. Process time is dependent on the size of the file, the CPU, amount of RAM and the amount of available resources at the time of the print. ***Linux versions: Ubuntu 12.04, Debian 7.0, Fedora 18, Mandriva 2011, Red Hat 6.4, Open Suse 12.3. **** Limited availability - contact your FARGO dealer for availability.